Researchers have discovered that honeybees can bite as well as sting and that the bite contains a natural anaesthetic. The anaesthetic may not only help honeybees fend off pests such as wax moth and the parasitic varroa mite, but it also has great potential for use in human medicine. The surprise findings discovered by a team of researchers from Greek and French organisations in collaboration with Vita (Europe) Ltd, the UK-based honeybee health specialist, will cause a complete re-thinking of honeybee defence mechanisms and could lead to the production of a natural, low toxicity local anaesthetic for humans and animals. The natural anaesthetic that has been discovered in the bite of the honeybee and measured at the University of Athens is 2-heptanone (2-H), a natural compound found in many foods and also secreted by certain insects, but never before understood to have anaesthetic properties. Independent tests have verified Vita’s findings and the potential of 2-heptanone as a local anaesthetic. As a naturally-occurring substance with a lower toxicity than conventional anaesthetics, 2-heptanone shows great potential. Vita has already patented the use of the compound as a local anaesthetic and is seeking pharmaceutical partners to develop it further. Until recently, research seemed to indicate that 2-heptanone was either a honeybee alarm pheromone that triggers defensive responses, or a chemical marker signalling to other foraging bees that a flower had already been visited. Vita’s results contradicted these notions. The new research clearly shows that 2-heptanone paralyses small insects and mites bitten by bees for up to nine minutes. 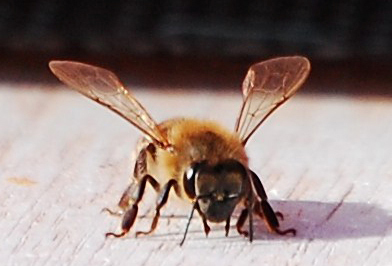 Somewhat like a snake, the honeybee uses its mandibles to bite its enemy and then secretes 2-heptanone into the wound to anaesthetise it. This enables the honeybee to eject the enemy from the hive and is a particularly effective defence against pests, such as wax moth larvae and varroa mites, which are too small to sting. In laboratory neurophysiological trials in the School of Biology of Aristotle University of Thessaloniki (Greece), 2-heptanone was found to have a similar mode of action to Lidocaine, the dominant local anaesthetic used in humans and other mammals. 2-heptanone is found naturally in many foods such as beer and white bread and is so safe that it is permitted as a food additive by USA regulatory authorities. 2-heptanone therefore offers considerable potential as an alternative to Lidocaine. Very recent laboratory research using mammalian cells in the USA, has confirmed Vita’s expectations that the anaesthetic could be as effective on humans and mammals as it is on insects and mites. The research has just been published in the peer-reviewed journal, PLOS ONE: http://dx.plos.org/10.1371/journal.pone.0047432. Several organisations contributed to the research in collaboration with Vita (Europe) Ltd: the Aristotle University of Thessaloniki in Greece, the French Centre National de la Recherche Scientifique (CNRS), Université Paris-Sud, Cyprus University of Technology, and the University of Athens. PLOS ONE publishes primary research from all areas of science and employs a combination of peer review and post-publication rating and commenting, to maximize the impact of every report it publishes. We are published by the Public Library of Science (PLOS), the open-access publisher whose goal is to make the world’s scientific and medical literature a public resource. All works published in PLOS ONE are Open Access.